despite my recent love affair with wild blueberries, i don’t think the kids or i are planning on giving up cultivated blueberries or raspberries any time soon. it does taste like summer. 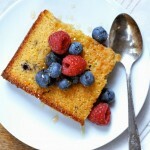 and a great way to use some of those extra fresh summer berries. winter will be here soon enough. Preheat oven to 350°. Line a 13- x 9-inch baking pan with parchment paper, allowing paper to overhang the sides of pan and spray with cooking spray. Combine cornmeal, almond meal, flaxmeal, baking powder, and salt in a medium bowl. Cream together butter and sugar until pale and creamy. Add eggs, one at a time, mixing between each addition. Stir in vanilla paste. Add half of cornmeal mixture and stir well. Stir in half of buttermilk. Add remainder of cornmeal and buttermilk; mix well. Pour batter into prepared pan. 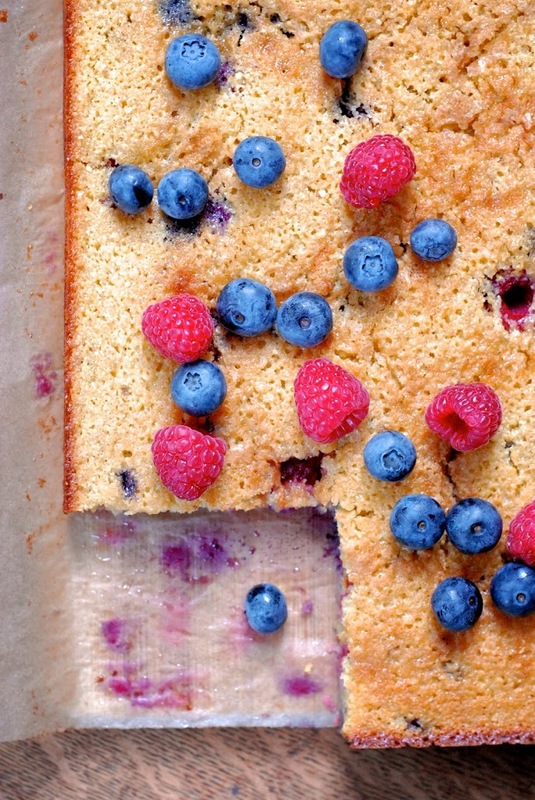 Sprinkle berries evenly over the top of batter. Sprinkle evenly with turbinado sugar. Bake at 350° for 45 minutes or until a pick inserted in the center comes out clean and top is golden brown. Cool completely. 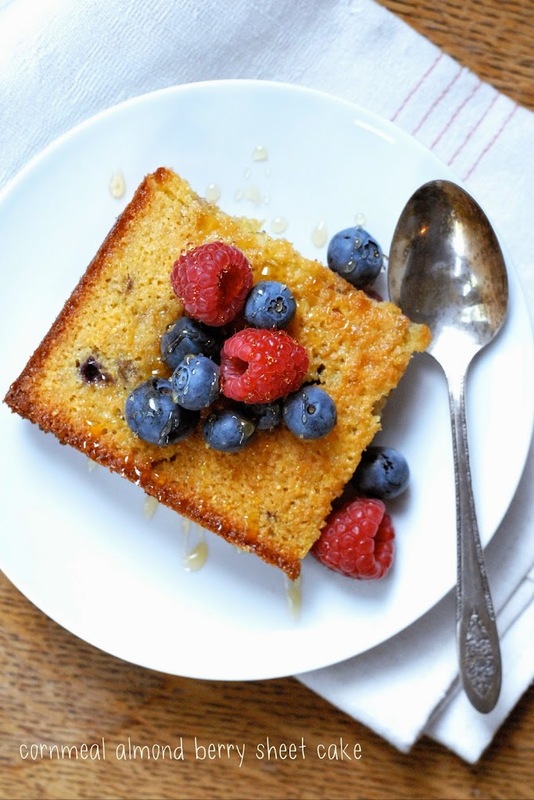 Remove parchment with overhangs and cut cake into pieces. 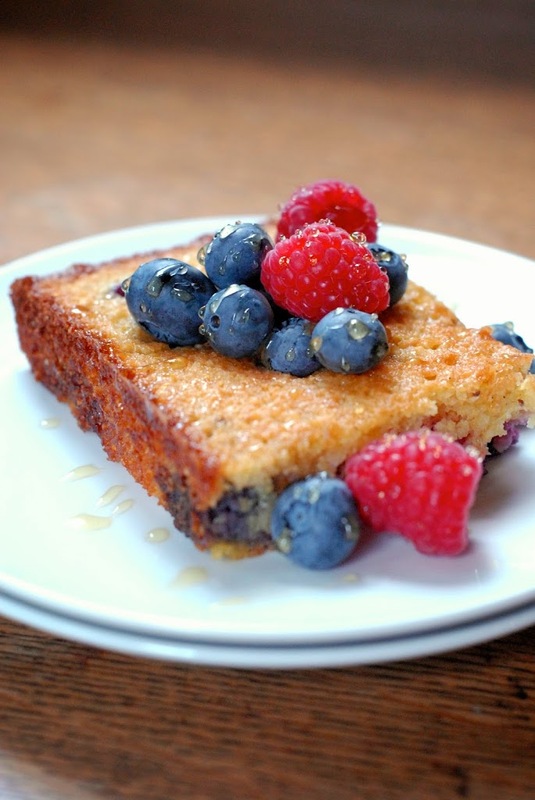 Top with berries and honey, if desired.